I am starting a "tools of the trade" series with picks for one reason and one reason only. That reason is that I already had taken these photos and they have been ready to go for months (I took them in October!). I do NOT think picks are the most important part of a bento at all. When I started bento-ing I didn't have any picks, and even now that I have a lot of them, you can see that I really don't even use them all that much! In terms of bento gear importance I'd rank them really low, to be honest. But, they are cute. Really cute. And when I was first getting started with bento it was picks I most coveted. 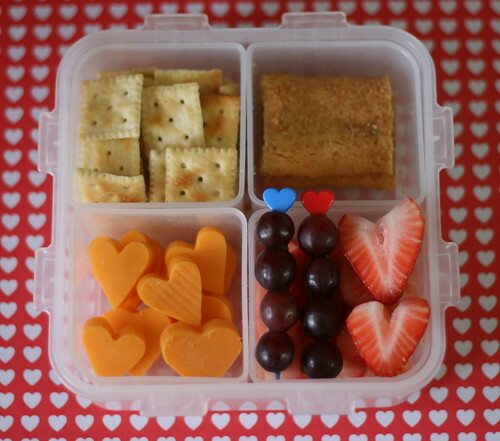 I admired them fondly and jealously in bento photos I came across and hoped someday to have a few sets of my own. 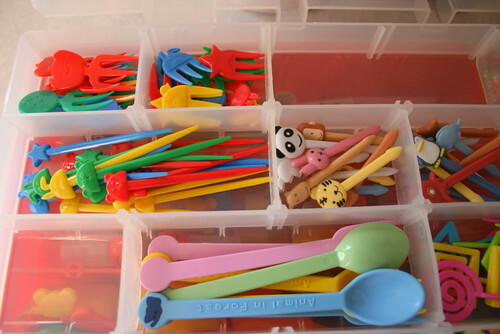 Picks can be handy to piece together fruit or other small foods into little mini-kabobs in a bento box. Another variety of picks that I call mini-forks are great for eating a lot of small pieces of food. 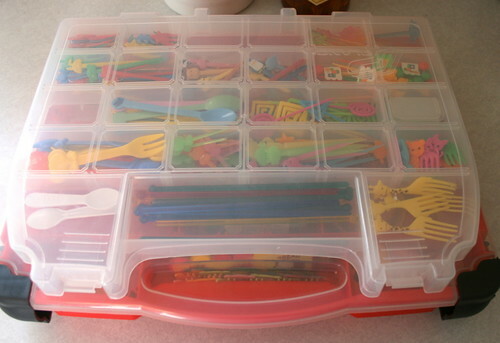 This is the toolbox I use to keep my picks and mini-forks, along with other small-sized supplies, organized. I found this case in the hardware section of Target a couple years ago and grabbed it up just as fast I could. Opening up the top lid a bounty of colorful bits smile up at me. Do you see those ones at the bottom with the geometric shapes at the tops? Those were the first picks I got my hands on. They are pretty easy to find at baking supply stores, they are "message fun pix" by Wilton . Do you see those ones in the middle with the little flags attached? I just had to have those. HAD to. I was desperate for them. A friend in California purchased them at a local bento supply shop and mailed them to me. And I have yet to use them. I'll have to get right on that. Here you can see some of my favorite picks. They are mini-forks shaped like animals. My mostest favoritest ones of all are the giraffes. I adore them. So much in fact that I had to have two sets to ensure back-ups and replacements. Though to be honest, in the three years of I've been packing bento lunches we have only lost about 3 picks total. Not bad. (I'm still relieved to have a surplus of my loveliest items though!). On the bottom you see my swizzle sticks. These are awesome! I think these were the second type of picks I acquired, after the Wilton ones. These are long, so they don't fit in all bento boxes, but I love them for making fruit kabobs on. They do fit nicely in the long and narrow bento boxes (which I don't use all that often, actually) and I also like them for use in the Goodbyn. I found these at a party supply store. I've seen them at all sorts of other places too, including grocery stores and Target. 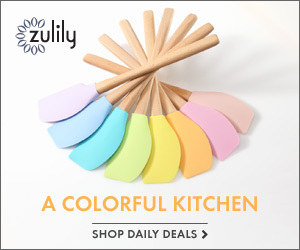 They are usually in the paper goods section, with paper plates, toothpicks and straws. Try to find some that are more narrow. A really wide swizzle stick will be harder to work with (splitting small pieces of fruit apart). 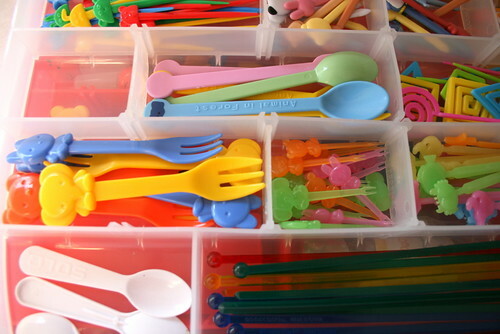 In this picture you can also see some of the short-handled spoons and forks I have. Those little white ones on the bottom are just the little spoons ice cream shops give you to take a sample taste from. I find them handy for tucking in a bento that I've added a mini-jello cup to. Where can you get bento picks? There is a chain of Japanese dollar stores called IchibanKan. They have a few stores in California and they used to have an online store too. My bento supplies collection grew a lot while their online store was open, but unfortunately it closed when the economy started tanking. If you are lucky enough to be in an area with an IchibanKan, or similar type store, Daiso, then you can pick up all the bento goodies you desire pretty easily! For the rest of us there is thankfully some online options. Amazon is selling more bento supplies every day (yay!) and there is JList. JList is an online site selling all sorts of Japanese items, including a lot of bento gear. 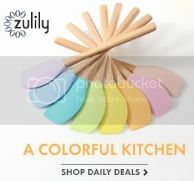 This link here will show you all of the bento picks they have available right now. Aren't you worried that these precious things they will go to school and not come home? 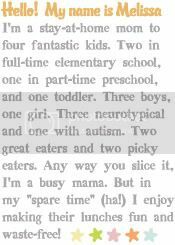 I mean the lovely picks, not the children :) :) You're getting me hooked, girl! Thank you! The timing of this post is supernatural. I stumbled across bento about a week ago and instantly fell in love. I discovered your blog a few days later and it's the only one to which I keep coming back. Sure, there are lots of websites with gorgeous character bentos and masterpieces, but yours gives me the most practical inspiration, while still being drop-dead-adorable. I made my first bento box out of a Wonder Bread sandwich box (had you not blogged about that, it would've never occurred to me). I was so excited and proud that I uploaded a picture to my Facebook! I ordered silicone cups and a Laptop Lunch set for my husband and am still trying to figure out if I want a Sassy box for my 2 year old, or one of those Hello Kitty bento boxes from JBox. My next step to feel like I had everything I needed to make bentos was to obtain picks. But I was baffled. How many, what size, what for? After pawing my monitor and drooling over your collection, I now know what to do! Thanks again for this blog! I am envious of all your cute pics now. I went to Amazon and almost bought a bunch of items but decided not to because my daughter has exactly 4 weeks of Elementary school left. I'm not sure how she will feel about opening up her lunch box and seeing all this cutesy stuff in middle school. I might just have to get some for myself though because they are just so dang cute. Thanks for sharing your collection. LOL Raji P. - I was very concerned about picks not coming home in the beginning! Especially since I had so few then. My oldest son is finishing up 2nd grade now, and since Kindergarten has lost 3. One of the Wilton picks was the first to go. One of the mini-forks he gave to a friend in Kindy who really wanted it (LOL)...so the casualties have not been bad! :) If I could just get the boy to stop losing his snack boxes I'd be thrilled! Oh my! That toolbox is genius! I'm going to use that idea. Ichibankan sounds like the type of place I would go crazy in, it is good they are not here in Texas. But sniff sniff, where can I get cutesy picks then? Amazon? I found some on eBay too. Maybe I should go check out the local Asian markets. Please send me your address, as I am going to send you the bill for all these purchases. But for you my children and I would be living quite happily with plain lunch boxes and big ol forks to eat fruit with :) :) My kids will go to grade 1 in the fall, and my son's appetite is growing every week, so I wonder how to pack enough protein and quantity in my bentos. Perhaps you can address that topic one day? and where did you find your little dip containers? I love this post! I can't wait to go out and get me a "toolbox"!! But then I will want to fill it up!!! I have been slacking off lately. :( Its close to the end of the school year and things get so hectic. lol. I've got atleast 5 bentos that I havent posted and more that I didnt even take pics of! Bad me!! Thanks for the inspiration! I was wondering how to get this organized, and it would make my mornings alot easier. We have not been doing this long, but already I have accumulated several items, which my son loves. I didn't realize there was clickety-clack picks. We have other clickety clack items and my son loves them. Thanks alot,now I'll be cruising ebay for the picks, haha. We are moving to Japan next month (military) and I came across your blog randomly on blogspot - talk about luck! My husband is already bracing himself for all the cute bento items I'm going to have to collect for my two children and myself! 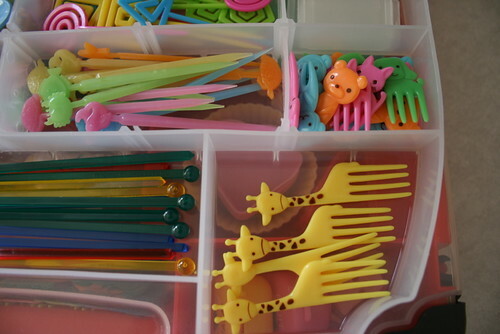 I just ordered a few sets of those animal picks (the kind with the dog, cat, giraffe, etc...). - got the package today, and was surprised at how small they were (I expected them to be at least a fraction biggier). :P Still, their small size makes them even cuter! Now I know why you mentioned the potential choking hazard with your daughter. Hi Melissa! Bentos are resuming over at www.bar7ranch.blogspot.com with school about to start back up. I am working on some supply/storage posts. Do you mind if I include your link and maybe a pic or 2 (with all credit to you)? THanks!! hi, i love this idea and i love the heart pics in the first picture, but havent run across any of those. do you know where i might find them? thanks! BrandiBrown - those heart picks are from a set of picks that also include some with stars, bears and bunny heads. 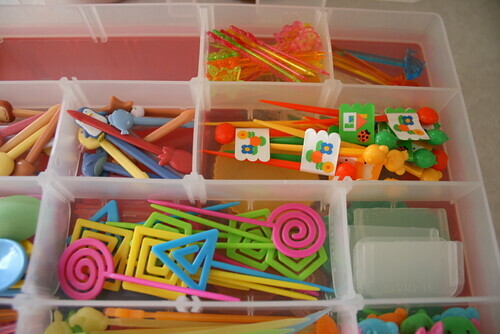 It's from a line called "Click Clack" and they come in a plastic cylindar case. Ebay might be your best bet - they've been around for a long time and I don't see them around that often anymore. What kind of pick is the really long ones? 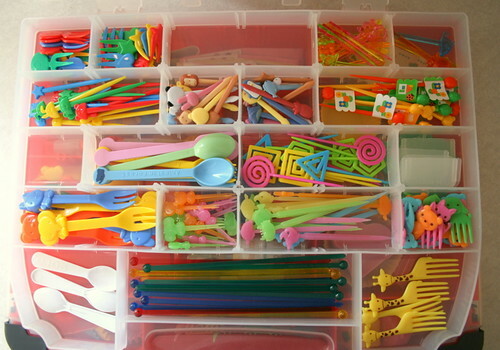 I've googled it and cannot find one....right now I use plastic coffee stirrers to make my "kabobs" for the lunch box. This is the most clever organisation form I've ever seen for all those cute things we use in obentos!!! Thank you for the idea! Since most of these are plastic picks.... I was wondering how well they hold up with reuse? Do you just handwash them? Can they be put in the dishwasher? Thank you! The plastic picks hold up really well. I handwash them. They are much too little to go in the dishwasher! Another Lunch in your email! new (super cute!) box - ribbit ribbit! lions & tigers & bears, oh my!